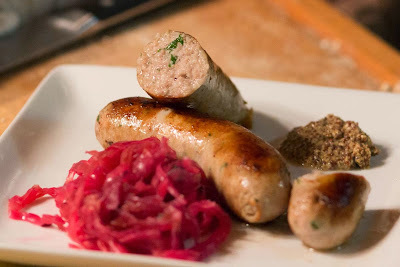 With October coming, I always get excited for Oktoberfest type dishes. I say "Oktoberfest-type," because it's not like I throw an Oktoberfest party, or even seek out German beer. Mostly, it's just cold weather and seasonal food coming together. My cabbage from September has fermented into sauerkraut, pigs have fattened up after a hot August, and the weather has turned cold enough to really savor a hot plate of sausages, kraut, roasted root veggies, and sharp mustard. 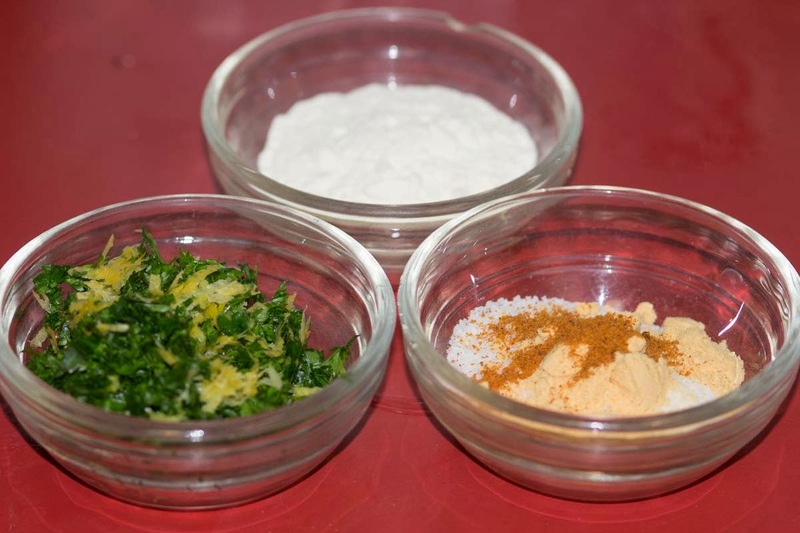 Plus, saying "Halloween-type dishes" doesn't really conjure images of shredded cabbage and pork. So getting into the Autumnal mood, I decided to get ready for cold weather by making a batch of weisswurst. 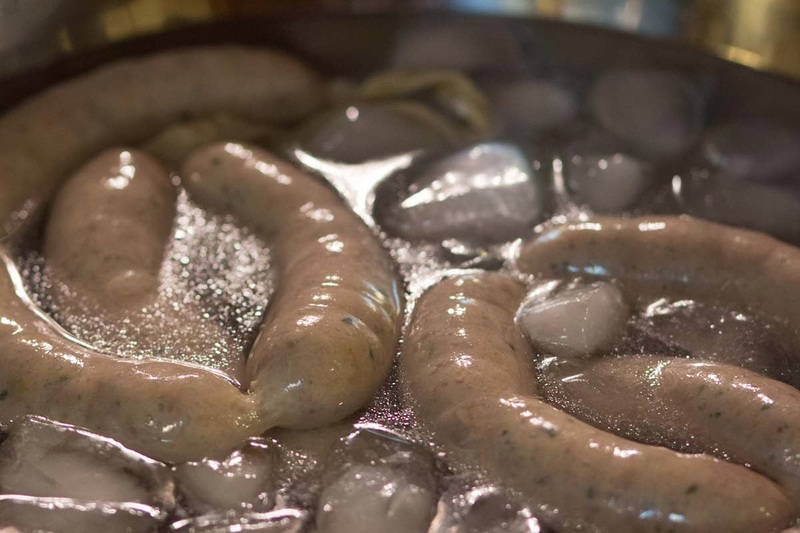 Weisswurst, or "white sausage," is a Bavarian emulsified sausage, made with veal. 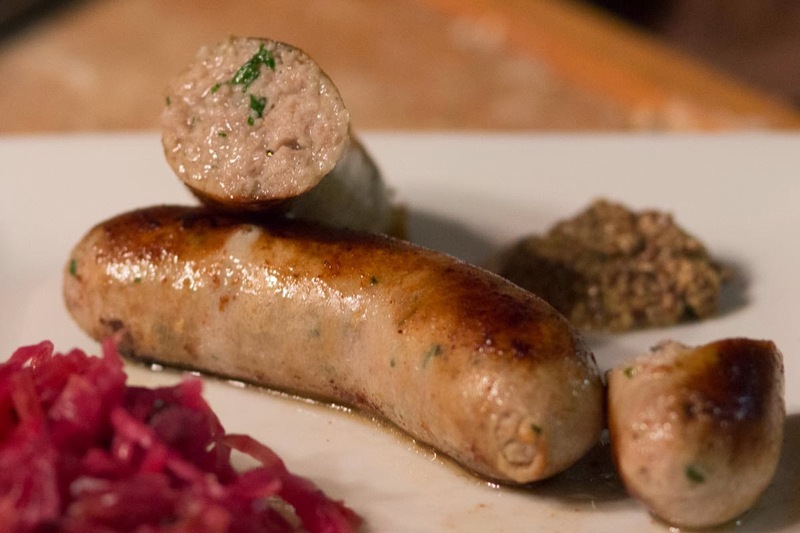 I stuck with the traditional seasonings of salt, mustard, mace, fresh parsley, lemon zest, and nonfat milk powder (which helps to keep the emulsion stable) I used pork, which does technically disqualify this as a real "weisswurst," but frankly I'm not paying for veal. Ethics aside, I find veal to have little flavor and a high price tag based solely on tenderness. I'm fine with rose veal, where farmers let male cattle grow to veal weight on pasture, but if I've taken the trouble to seek out rose veal, it's not going into a grinder. But I digress. 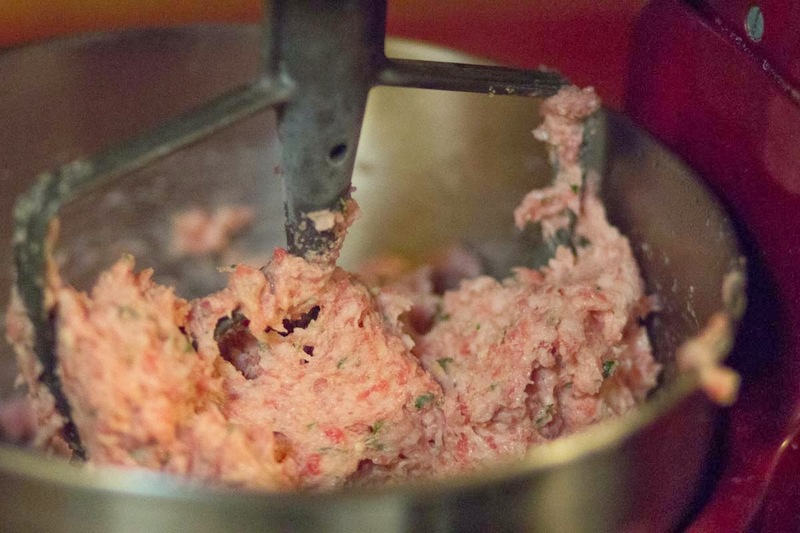 An emulsified sausage is simply a sausage in which the fat is completely whipped into finely ground meat. Think about an Italian hot sausage next to a frankfurter. The Italian has a coarse definition, while the hot dog has a smooth, even texture inside. Whipping eggs into olive oil to create mayonnaise is the same thing - an emulsion of protein suspended in fat. Making an emulsified sausage is a lot like making coarse ground sausages, except 1.) everything needs to be kept cold so the fat and meat don't separate out and 2.) once the meat and fat are finely ground together, they're whipped together to blend the fat and meat into a seamless mousse. That's probably the hardest part of this sausage - keeping everything at temperatures just about freezing. Thankfully we have a chest-style deep freeze, so I could keep a frozen baking sheet right on top to quickly spread out the meat mixture and cool it down. Plus I kept my mixing bowl, grinder, and grinder plates all frozen until it was time to grind. Once the meat and fat are evenly distributed, you have a beautiful, whipped-mousse like product. To keep this mixture stable, the sausages are gently poached at 160 F until they reach an internal temperature of 150 F. I poached the sausages in a pork stock I made from the shoulder bones that were leftover from getting the meat deboned and cubed for the grinder. 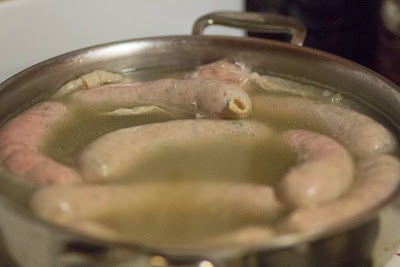 After about 20 minutes of poaching the sausages go into an ice bath to keep them from overcooking. From here they're ready to eat, or they can be stored in the fridge and reheated in a skillet or on the grill later on. 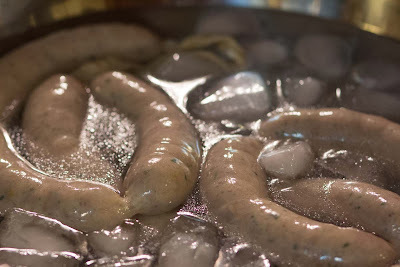 Reading about weisswurst, I was a bit baffled to learn that it's traditional in Bavaria to not eat the casing. You either slit the sausage and scrape out the meat, or (in what I imagine is often messy and obscene) the end of the casing is cut off and the center is sucked out. Thankfully I opted not to Google image-search this. Regardless, I've found that any poached sausage in a natural casing has a tender and nearly unnoticeable casing, so I'm not really sure about the fuss.